Black Market was founded in 2004 when Carter Holland lusted after a bike that was somewhere between the current 26″ wheeled offerings and the BMX bikes he enjoyed riding so much. The first fully suspended result of that thinking was the Killswitch, a 100mm travel bike that was designed to slay dirt jumps and slopestyle courses, with the brand gaining a good following in those circles. In 2012, Black Market stepped up to the plate with their Roam, a trail bike with 120 – 160mm of adjustable travel. Despite being touted as an all-rounder, the Roam certainly carries some of the DNA found in the Killswitch. 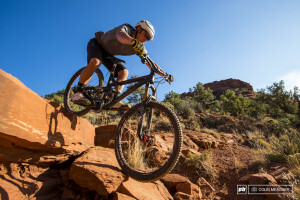 2014 sees a number of changes implemented on the Roam, including to its geometry and the frame’s ability to be easily configured to accept 26″, 650B, and even 29″ wheels thanks to its ‘All Wheel Drop-Out System’. Offered primarily as a frame-only (without the shock), the Roam is available in extra-small, small, medium, and large sizes for $1,999 USD. Our test bike was assembled with a custom mix of solid components and 650B wheels that reflect its intentions as a hard charger, and we ran it in the longer 160mm travel mode for the duration of our time on it. The Roam frame is constructed from large diameter 6061 aluminum tubing, and much like the Killswitch, a priority has been placed on both stand over height and having a low center of gravity. A cutout near the bottom of the down tube is home to the bottom shock mount, with it being compressed at the other end via a floating link activated by the rear triangle. Out back, the All Wheel Drop Out System allows for chain stay adjustability, as well as the acceptance of the three wheel sizes – one set of dropouts will take care of 26″ wheels, while 650B and 29″ wheels are accommodated via an optional dropout set that can be installed in place of the stock units. Moving to the front of the bike, a tapered head tube that uses pinch bolts to hold both the top and bottom cups has been employed, a design Black Market claims helps to greatly limit the chance of ovalizing a head tube, as well as making installation and removal much easier. Black Market uses their ‘Hammer Link’ suspension design that mounts the shock extremely low on the bike. Up front, a pinch bolt head tube allows for easy headset installation. The bike’s cable routing is relatively clean and easily accessible, with the brake and derailleur cables routed on the top of the down tube, while the dropper post housing sits nicely on the underside of the top tube. A traditional thread-in style 73mm bottom bracket allows for endless crank options, and ISCG 05 tabs give riders the option of easily installing a guide (our test bike featured an MRP G3 SL chain guide) or bash guard should they require one. There is a spot to bolt on a direct mount front derailleur as well, although our single ring setup left it as a bit of an eyesore on an otherwise great looking bike. The 120 – 160mm travel Roam utilizes a longer stroke version of the Hammer Link suspension layout found on the Killswitch, with the stout linkage that compresses the shock almost completely hidden by the forward section of the swingarm. This gives the bike an incredibly clean appearance that makes some of the other designs out there look a touch cluttered in comparison, and access to the linkage hardware is still possible thanks to small openings machined into the system. Linkage aside, the Roam’s swingarm rotates off of a single pivot located just above the top of a 36 tooth chain ring, with gold anodized aluminum hardware holding everything together. Suspension travel is adjusted by way of a shuttle mount that moves the shock either forward or back in order to alter the leverage. Sliding and replaceable dropouts make for triple wheel size compatibility, and the Hammer Link suspension allows for travel adjustment between 120mm and 160mm. Getting the Roam to drift across the trail quickly became a predictable and controllable action, and it wasn’t long before we had enough trust in the bike to push hard through each dusty and loose corner. The Roam’s cockpit has a very compact feel that riders who prefer the playful feel of a smaller bike will appreciate, although those who would rather have a more stretched out position for longer rides could find themselves a touch cramped. Our medium sized test bike featured a virtual top tube length of 22.9″ that put us in a relatively upright riding position, but it did prove to be comfortable, even after a few hours in the saddle, so long as you take a more relaxed approach to the day’s plans. Taking a relaxed approach is helpful when climbing as well – we found that the Roam felt a bit sluggish when gassing it uphill, something that could be attributed to the bike’s somewhat hefty build (our test bike weighed in at 33 pounds), and the slack 66° head angle. An ultra savvy singletrack climber the bike is not, but we also don’t believe that was Holland’s intention when he listed out his wants and needs for the Roam. The middle compression setting of the RockShox Monarch Plus became our go-to position whenever the trail pointed upwards, since the firmed-up ride this provided allowed for a bit more jump to the bike’s progress. Long gradual climbs required a little extra effort aboard the Roam as well, with its weight becoming even more noticeable on ascents that had a good amount of mindless pedalling. Granted, our test bike had a 36 tooth front ring and a parts kit geared towards durability and strength, not setting hill climb records – do yourself a favour and lean towards a lighter build kit if you plan on doing exactly that. Forgetting about the gripes with the Roam’s climbing ability happens to be easy once the trail starts to head the opposite direction – cut the Roam loose through a few choppy turns and its design philosophy becomes much more apparent. 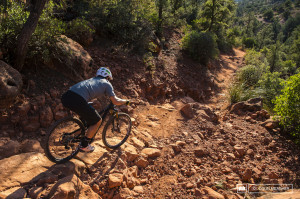 Short-ish chain stays keep the rear wheel planted as the Roam cuts smoothly from one side of the trail to the other, instilling a new level of confidence through tricky turns. Getting the Roam to drift across the trail quickly became a predictable and controllable action, and it wasn’t long before we had enough trust in the bike to push hard through each dusty and loose corner. 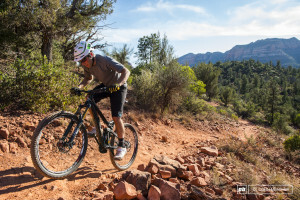 Once opened up, the Roam’s slack 66° head angle became beneficial, and kept us confident in pushing the pace on unfamiliar trails, and all levels of riders will benefit from the bike’s deft handling abilities in this regard. We did notice the FOX Float 34 seemed a bit under-gunned compared to the frame’s extra-zealous attitude while descending, and a FOX 36 might better suit the Roam’s downhill strengths more than the lighter 34. That’s not a slight against the 34, though, just that the bike’s handling allows for some seriously hairball speed, and a really aggressive or larger rider might benefit from a burlier fork chassis. The Roam remained stable yet playful, even on high speed downhill sections. Stability became the key term that resonated over and over with us while aboard the Roam, and its stout tubing and low shock position offered an extremely rigid feel. This, despite the rear quick release axle that is a bit of an oversight in our minds given the bike’s intended use and overbuilt feel elsewhere. While it’s a bit of an over used term, labelling the Roam a downhiller’s trail bike would be an apt description of how we feel about it. It is the kind of machine that won’t make you pause when rolling into that large jump or drop, even more so than many other bikes in the same class, and it can rail any turn you aim it through. We loved the Roam’s ability to push us when the trail got overly technical, and its stability kept allowing us to go faster. • Novatec Diablo wheels: Giving us the power of the Devil, the Diablo wheels performed flawlessly as we thrashed the Roam. The hubs were smooth, with great engagement even when we found ourselves pushing too big of a gear through steep pitch changes. • Avid Elixir 5 brakes: Although we’ve certainly experienced some Avid brakes that offer an inconsistent feel from the stock bleed, the brakes on our Roam were firm and reliable throughout testing. • Shimano Zee derailleur: The Shimano Zee Shadow Plus rear derailleur performed extremely well during testing, and is a great example of how clutch derailleurs really improve the on trail experience by reducing chain movement when the things get rough. • Profile Racing cranks: Although it’s not a crankset we see spec’d too often on trail bikes, and certainly not the first choice of anyone concerned about weight, we were pleasantly surprised with the Profile arms’ stiffness and stout aesthetics. The bike’s sturdy Profile crank arms and MRP G3 SL make for a reliable setup, while its Novatec wheelset also proved to be fault-free. ← Justin Wyper’s Black Market Edit1.